This important Staffordshire factory was situated at Longport and run by John Davenport. Originaly an earthenware pottery, it began to make good-quality porcelain of hybrid hard-paste type c.1800, and from about 1810 onwards it concentrated on bone china tea and dessert services. At the beginning of the 19th century the factory was very fashionable and numbered the Prince Regent among its customers. Pieces from this period are of superb quality, rivalling Spode, Swansea or any other English manufacturer. From around 1825 the forms were influenced by rococo revival and many of its basic shapes are close to the Coalport designs of the period. The factory continued to flourish and by 1840 Davenport & Co. were retailing from 82 Fleet Street, London and had warehouses in Liverpool, Lubeck and Hamburg and become manufacturers to William IV and Queen Adelaide. Davenport porcelain body and decoration are of a very high standart and many unmarked pieces can be found incorrectly labelled "Rockingham". The factory produced some especially elegant Empire-style teawares in forms that seem to be unique. 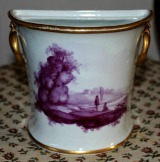 A rare early Davenport porcelain bough pot, circa 1810-15 of 'D' section and ring handles, painted in purple monochrome with a picturesque landscape. Dimensions: 14cm high. Marks: impressed Davenport and anchor mark. Condition: Cover missing, one handle restored, a tiny chip on the foot rim. A Davenport Porcelain Plaque c.1850-60 of rectangular shape printed and painted with a scotish view. Dimensions: 17cm x 11.5cm. Marks: Impressed "Davenport Patent" and an anchor device in between. Excellent condition. A Pair of Davenport Porcelain Botanical Dishes c.1820 of rectangular shape, finely painted with named botanical specimens within matt green borders and gilded rim. Dimensions: 24 cm x 20 cm. Printed marks, "Tall Browallia" and "American Cowslip" painted in red. Fine condition. 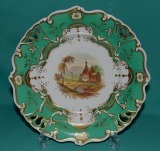 A Davenport Porcelain Dessert Plate c.1850, with pierced border and flower moulding, picked out in gilt, painted with a landscape on apple green ground. Dimensions: 22.5 cm diam. Marks: Pattern 2280 painted in red. Condition: Minor ware. A Davenport Armorial tea cup and saucer, Etruscan shape with angular handle, decorated with raised gilding and a family crest. Dimensions: cup 5cm. high x 9.5cm diam. 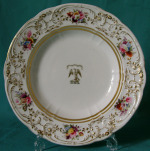 ; saucer 14cm diam. Brown printed and impressed marks c.1870-86. Excellent condition. Early 19th century Davenport Armorial soup bowl c.1815 with French-style relief-moulded edge (copied at several English factories) and hand paited flower sprays, with a family crest in the centre. 9.5"(24cm) diameter x 1.5"(4cm) depth. Printed marks in brown c.1815* Fine condition, just slight rubbing on the gilding. Superb English cabinet plate c. 1835 (possibly Davenport) painted with flower bouquet on brown ground in the centre and green border with vermicelli pattern in gilt. Dimensions: 9.5"(24cm)diameter. Unmarked. Excellent condition. A Pair of dessert plates c.1870, painted in enamel colours and gilt, with a pink border and painting of cattle in the centre. 9"(23cm) diam. Standard mark, DAVENPORT/LONGPORT/STAFFORDSHIRE under a crown, printed in puce. Pattern number 1762. Excellent condition.